This is the very same inkjet film that Catspit Productions uses in house. This film can achieve 70% to 80% opacity without RIP software depending on your printer*. This is the absolute best film to work with especially if you do not have RIP software. With many emulsions such as dual cures, this film kicks but! I am sure this will be a major improvement to any home created film positives or copier transparencies from the copy store. Instructions for use are included and as always with any Catspit product you get free technical support. This film purchase is non refundable and no exchanges are given. Please try the film by ordering the 15 sheet pack and test it yourself before you buy a larger quantity. Please note that this inkjet film does not have a white guide strip on it at all. If your printer needs the white guide strip on clear media, then this film will not work. Make sure to check to see if your inkjet printer can use totally clear media. All in one printers may pose a problem like the Epson Artisan 710 is known to. *For maximum density without RIP software, use CMYK mode and a color rich black. You can achieve a color rich black by adjusting the CMYK levels to 100% for each. Set the printer to Photo Paper Pro and the highest quality print setting. Place a sheet of Catspit’s Super Inkjet Film Positive into your sheet loader, sometimes called auto loader, with the notched corner in the top right hand position. The film is coated with an emulsion to receive the inkjet ink on one side. It is important to make sure the notch is in the top right corner when inserted into the printer’s sheet loader and the film is facing you. If your printer has a bottom front sheet loader the notch will be in the lower left corner. 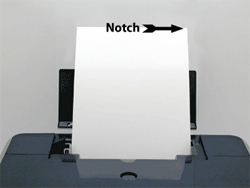 If your printer sheet loads from a different position, just orient the notch so it will be in the appropriate position using these instructions as a guide. The side of the film without emulsion is smooth and very shiny. The side which receives the ink is sort of sticky and matt looking. Set your printer to the highest quality settings in which it lays down the most amount of black ink. This will often be the Premium Photo Paper setting but you will need to experiment with your printer settings to see which setting works best with your specific printer. Allow the film to dry before attempting to work with it. It should be dry to the touch within a minute or two after emerging from the printer. Let the ink set for 30 minutes prior to using for best stability and durability. The film is now ready to expose your stencil.